Student entrepreneurs light up the crowd at CitySpark 2019. There were over 100 applications to the student entrepreneurial competition which saw 10 finalists compete for the £25,000 available to their businesses. The judging panel consisted of Emma Lange, Programme Advisor at Impact Hub Kings Cross, Gina Dorodvand, Co-Founder of Onaria Technologies, Ivana Ng, VC Investor at YYX Capital and John Mavriyannakis, Chief Operating Officer at OneEleven. The new winning businesses will now be invited to join the Launch Lab. Umadevi Dassaye (BSc, Actuarial Science) and Shellpod Shampoo, an eco-friendly alternative to bottled products, scooped the top prize, marking her third victory after winning at CityStarters Weekend and CitySpark Marketplace. Umadevi who is one of the newest members of the Launch Lab said: “I am very proud of my team and winning CitySpark will help us develop our marketing materials and refine our prototype shampoo ball. “Taking part in the previous competitions has helped me with my pitching skills, but it has also given me a platform to network with other business professionals who can help shape my ideas with their expert feedback. Simple Studying, a four person legal education platform coming from the City Law School, took home the second CitySpark prize. The People’s Choice award went to Calm Creation, a mindfulness art box venture which encourages users to focus on their mind by drawing with music. The founders Tessa Etkin-Silver and Tata Arunyakanon, (MA, Entrepreneurship), had previously won at the CitySpark Christmas Market Place. The MakerSpark prize went to Noor Alrayes, (MSc Cyber and Information Security, 2017), with her cyber security consultancy, Alien Security. The GreenSpark prize was awarded to Ross Jones, (MSc Food Policy), and his sustainable zero waste catering company, Seven Cherries. Former CitySpark winners and Boxpark Shoreditch residents Eat Chay were also invited to give an update on their journey since progressing from the Launch Lab. Umadevi said: “It was great to hear from Eat Chay, as they were once in the same position as us. We can relate to them as we are also a team full of international students who are passionate about our business. An innovative legal platform that aims to improve the academic performance of law students across the UK. Simple Studying enables students to connect with each other and build a community of law students. A single-use solid shampoo ball that dissolves in water. It is an eco-friendly, biodegradable alternative to bottled liquid shampoo that you can use every day. It comes dry and therefore does not require any plastic packaging, making it 100% waste free. Umadevi Dassaye (BSc, Actuarial Science), KK Thwe Sunn, (MSc, Health Management), Chitra Yadav, (MSc, Management), Xianghui Zhan, (MSc, Entrepreneurship), Abou Mersch, (BSc, Business Management) and Arihant Jain, (MSc, Management). A mindfulness art box venture which uses purpose-made boxes which come with art supplies and easy-to-follow instructions that are shipped directly to customers’ homes on a subscription basis. A cyber security consultancy that provides ethical hacking services for the purpose of finding security vulnerabilities that a malicious hacker could potentially exploit. Alien Security focuses on the most important aspect, which is protecting data, and strengthening cyber security readiness. A sustainable, zero-waste catering service, delivering the highest quality events across London and the UK. Their produce is 75-90% organic and their meat is free range with a blanked list of banned unsustainable products and ingredients, which are never used in our menus. 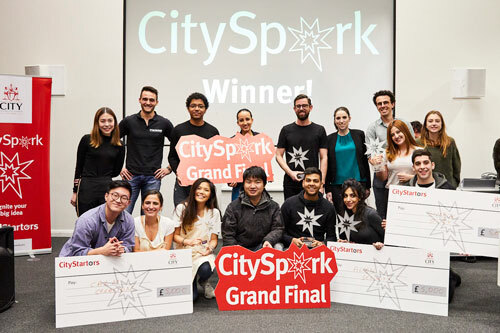 The CitySpark competition is run by CityStarters, part of the Entrepreneurship Team at City. More information about entrepreneurship at City can be found here.